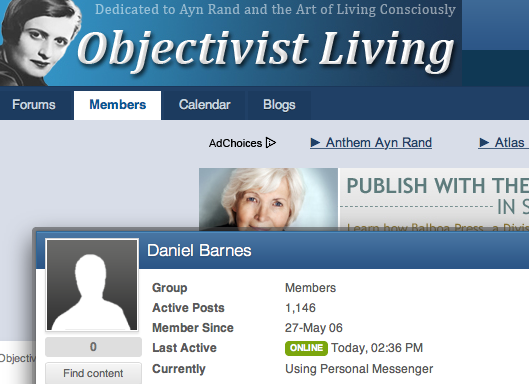 In response to a commenter who claims that ARCHNbloggers like myself are too "cowardly" to go on Objectivist sites and debate their philosophy first hand, here's a couple of screenshots of my user activity on a couple of O-ist sites from a few years back - Rebirth of Reason (formerly SoloHQ), and Objectivist Living. There's nearly 2,000 posts there, covering a period of around a decade, all under my own name - which is more than can be said for this particular fellow, who in a totally non-cowardly way prefers a pseudonym. So, so much for that. Will I now rise to his challenge of going on and doing it all over again on Objectivist Answers? Well, clearly I hardly need to, and for now I have better things to do. 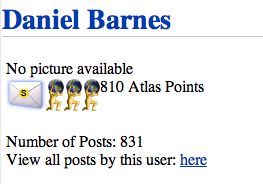 I'm not even spending that much time in the last few years on the ARCHNblog. It was fun while it lasted, but there isn't that much that interests me about Objectivism these days - I've heard it all before. The three-part adaptation of Ayn Rand's Atlas Shrugged ended with a whimper this weekend. 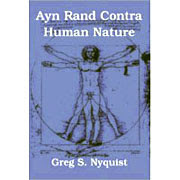 Opening at 242 theaters, Atlas Shrugged Part III: Who Is John Galt? bombed with just $461,179*. In comparison, the first two movies each opened above $1.68 million. To be fair, the second outing opened at over 1,000 theaters, and both previous movies had more marketing/publicity ahead of their launches. Ultimately, the entire three-part endeavor will likely wind up with less than $10 million at the domestic box office (and not a whole lot overseas as well). The troubled production history is surely to blame for some of this—the cast changed with each installment—though it does call in to question whether the novel is as popular as it's perceived to be. Never fear, the business masterplan will be to cream it on the merch! Just 9 more sleeps to go.